This website began in 2015 as an initiative of the International Bonhoeffer Society - English Language Section, to call together a virtual community dedicated to the life and legacy of Dietrich Bonhoeffer. The society itself was founded in 1973, and enjoys strong ties to the German Language Section of the International Bonhoeffer Society (Internationale Bonhoeffer-Gesellschaft Deutschsprachige Sektion), which operates its site in conjunction with Gütersloher Verlagshaus under the name The Bonhoeffer Portal. During the years 1973 - 2015 the society published regular newsletters (available here) which, over several generations, served to maintain the society's identity and offered its members a rich stream of knowledge and information relevant to Bonhoeffer studies. However, in 2015 the society decided to leave its paper newsletter behind and instead devote its energies to online publication in order to become more versatile and reach a wider public. The Bonhoeffer Center is the result of that decision. 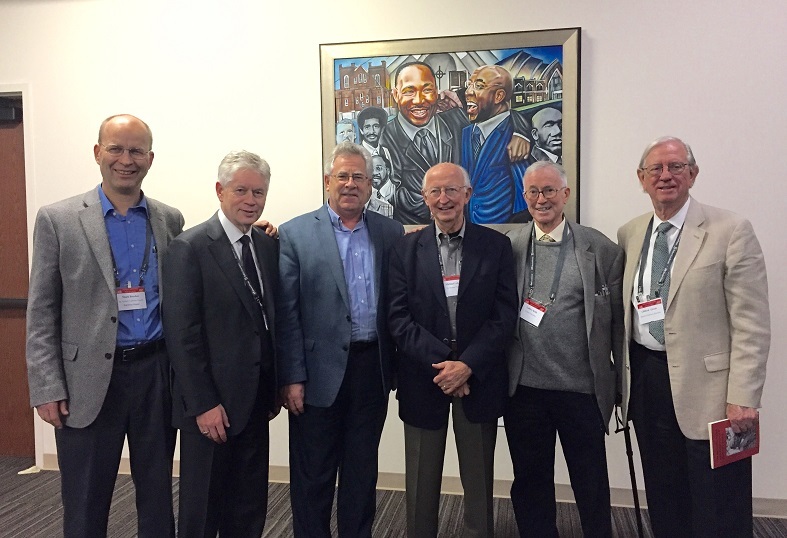 The past six presidents of the Bonhoeffer Society are shown in this photo taken at the annual dinner (Atlanta, November 2015). From left: Mark Brocker (current), Gaylon Barker, John Matthews, Michael Lukens, Geffrey Kelly, and Clifford Green. The mission of The Bonhoeffer Center is to offer quality resources for the study of Bonhoeffer's life, thought, and legacy in order to support the public witness of Christian scholars, pastors, teachers, students, and activists. To recommend items for publication, please direct items to the attention of the appropriate person(s) named above. Note that these categories reflect the five major content areas of this website.